A) The cheesecake was mighty delicious and I’m not even a huge cheesecake fan. 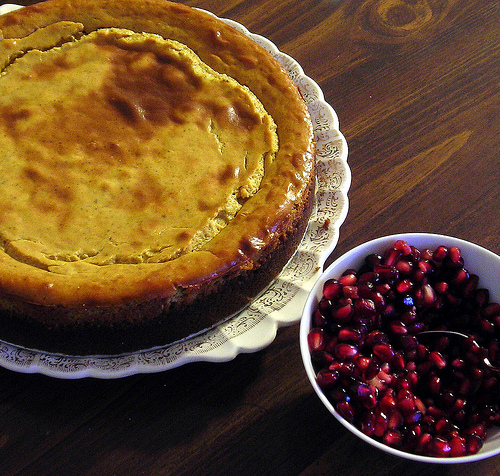 B) There is a cool visible layer on the outside of the cheesecake, which I love! C) I wanted to show everyone that I do, occasionally, make desserts that aren’t from Baked! D) This recipe can easily be made gluten free and I know that everyone appreciates a good gluten-free dessert! I am also excited to be sharing this recipe because it is, in fact, a really cinchy one. Although, I am not happy that I still, somehow, managed to make not one, but two mistakes while preparing it! It was fifty percent my fault and fifty percent the fault of a missing step in the original recipe, but still . . . two mistakes! Oy vey. It actually turned out to be super yummy despite my errors, and I am thus posting my slightly altered version of the recipe, instead of the original. Oh, and please note, the pomegranate seeds have nothing to do with the recipe, but were part of delicious pomegranate/orange juice/champagne concoction that was served before dinner. You can find the complete recipe after the jump. 1. In a food processor, process the gingersnap cookies. Mix the cookie crumbs, ginger, and butter and press into the bottom and up 1 inch along the sides of a 9 inch spring form pan. 2. Bake the crust in a preheated 350F oven for 5 minutes and set aside. 3. Sprinkle brown sugar on top of baked crust. 4. Cream the cream cheese. 5. Mix in the eggs one at a time followed by the sugar, pumpkin puree, vanilla and then the spices. 6. Pour the mixture into the spring form pans. 7. Bake in a preheated 350F oven until it is set, about 60-70 minutes. 8. Let it cool completely. 9. Chill the cheesecake in the fridge overnight. A magnificent cheesecake! Great flavors, yummy.